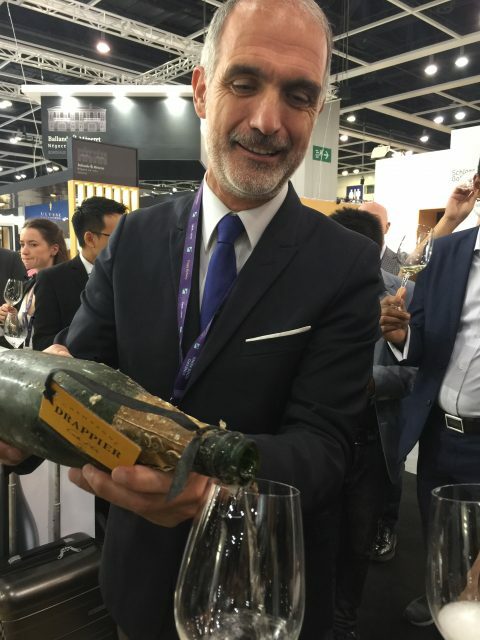 Champagne Drappier unveiled its ‘Immersion’ project in Hong Kong during Vinexpo this week, with Michel Drappier stating that the “perfect conditions” achieved underwater help to slow down ageing, similar to cooking meat by poaching rather than pan-frying. Michel Drappier, founder and winemaker at Champagne Drappier, presented two Champagnes from the Immersion project – Grande Sendrée 2005 and Carte d’or Brut NV – to a packed crowd of curious wine lovers, who were eager to taste the results of sea ageing for the first time in Asia at Vinexpo Hong Kong. “We produce Champagne without sulphite, unfiltered, from organically grown grapes, therefore the idea is to keep the Champagne in good condition because natural wine sometimes can be too fragile,” Michel explains while talking to dbHK prior to the uncorking. The Immersion project came about after his first attempt of ageing the wines up in The Alpes about 20 years ago. The project despite much effort led to subsequent failure because with increased altitude comes decreased pressure, which means pressure in the wine bottle ended up being higher than the pressure in the surrounding environment. As a result, “we lost bubbles in the wine, and it sped up ageing process,” he lamented, recalling the experiment. With that lesson in mind, Michel decided to go completely the opposite – 30 metres down under water to be exact. “What I did was to calculate the pressure under the sea, so we could reach approximately the same level of pressure outside and inside the bottle,” he explained. “The depth has to be calculated according to the salt, so when the water is too salty, then you don’t have to go that deep, so everything was calculated for the water”. In addition to pressure, light has to be carefully monitored as well for storage. According to Drappier, at 30 metres under the sea off Brittany in France, the underwater lighting environment is similar to Champagne cellar. “At that depth, it’s very dark, very similar to a Champagne cellar and also we are in the seas around Brittany, not off an island in Fiji, so not a very sunny lagoon. It’s dark,” he stressed, adding that the bottle colour for under sea ageing is crucial as well. The brown bottle used for the experiment is produced using recycled glass, with which can filter 99.7% UV light, he ascertained. For temperature, the vintner said it was 10 degrees celsius in the area where the wines were aged, the same as a Champagne cellar. The effect of the sea ageing, according to Drappier, is believed to have helped slow down a wine’s ageing process, while making comparisons between slow boiling and pan frying in cooking to illustrate his point. “We have seen the bottles aged in perfect conditions because of these reasons. The bottle are aged in liquid…when you cook a piece of meat in water, it’s soft heating in comparison to pan-frying. So I think the liquid slowed down the ageing, probably part of the positive effect of the sea,” he reckoned. The allocation for the sea aged Champagne is limited but is available in Hong Kong through its local importer Ponti Wine Cellars.